Diggers Valley: 28 May 2005. The week beginning 28th May 2005. After a few days of dry weather, it's raining again - it always amuses me that every year, we suddenly change from wishing it would rain, to wishing it would stop!!! It hailed today! It's suddenly very cold. I watched Ivy and the bulls across in one of the treeless flat paddocks, ignoring the old truck-canopy shelter we'd put in the paddock to provide shade during the summer, standing with their tails to the weather in a corner. I did not go out with an umbrella! Later on I moved them into the next paddock, where they'd have shelter in the lee of a hill and the scrub growing along the fenceline. We had visitors today, here to look at some of the weaner heifers and the five empty cows which I will either send to the works, or sell to interested buyers. Because I'd moved both cattle mobs in the last couple of days, we walked out to see them where they were - right at the back of the farm in the case of the cows. During the last few months, it has become increasingly obvious that our cattle race was simply too narrow. Stephan built it years ago, to the appropriate specifications for mature cow size at the time, but since then, cattle have grown! The three big most-recently-arrived stud cows, in particular, were having to squeeze, obviously uncomfortably and with a great deal of effort, into the beginning of the race. 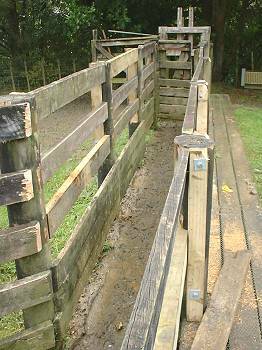 We had previously widened the area where the weighing platform sits, so the cattle could be weighed accurately without their bodies being held up by the rails as they stood on the scales, but at that time the width of the rest of the race wasn't particularly pressing (pardon the pun) problem. By removing the rails from the insides of the posts and reattaching them to wood bolted down the sides of those same posts, we've increased the width by as much as ten centimetres (four inches). I separated the little heifers from the older ones a couple of days ago, so that they could graze the paddocks with the new grass. They're quite nervous as a group, which will gradually change over the next few months and some will no doubt become quiet enough to touch, as has happened with the calves from the previous year. I am break-feeding (dividing the paddock with electric fencing tape) and had just moved the tape up the paddock, in the picture above. Whilst doing a paddock inspection this afternoon, I smelt a nasty odour on the gale-forced breeze. Investigation revealed the presence of a very large dead cow in the river. It would appear that a neighbour's one remaining cow, had gone into the river-bed (fallen?) and been unable to get back up the bank, and had then died. I am appalled by this lack of care on the part of the owner of the cow. I spoke to the man by telephone during the evening, to alert him to the fact that his dead cow was in the river and he said the cow had been missing for about a week, but he was waiting for the local pound to get hold of him, if they found her on the road. It would appear that he didn't bother to search his small property for the missing animal. I do not understand why people keep animals if they don't give a damn about what happens to them - if nothing else, they're not worth anything upside-down in the river! There are all sorts of publications around, including legislation, about minimum care standards for livestock, but in some cases they make very little difference. Where are the animal rights activists in these situations? Activism in this area, aimed at changing attitudes and educating rural people about their responsibilities to animals in their care, would go a long way to reducing a lot more suffering than the concentration on abattoir sites which I so frequently come across on the internet. There are many worse deaths than being trucked to the works! There's a lot of public awareness about the evils of factory farming and a growing ground-swell against things like battery poultry production of eggs, thanks mainly to animal rights groups. Many welfare issues in abattoirs have been addressed as a result of public or market pressure and the fact that meat quality is reduced when animals are stressed as a result of not being treated with care on the way to and in the processing plants. But animal welfare issues on small farms in particular, are becoming more widespread with the entrance of people without animal-care experience into "lifestyle" farming. There is more to looking after animals than just putting them in a paddock: they need to be appropriately fed, supplemented in the case of trace-element deficiencies, provided with shelter from the elements and checked on regularly to ensure they are in good order. To do it well takes skill, knowledge and empathy, and at least two of those may be acquired with a little effort. If you have animals and you're not sure about appropriate care in any situation, find out! Ask a vet, ask a farmer, ask me. If you're an animal activist, what are your thoughts about this particular problem? If you care about such things, what do you think? Send me a considered and well-written piece and I shall dedicate a new page to animal welfare awareness and debate.